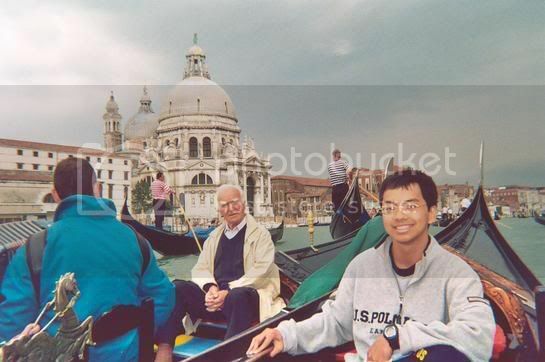 Me riding a gondola in Venice, Italy. People often ask me for advice about Europe. Check out this e-mail I wrote to a friend, which has my recommendations. If any of you want any more specifics, just drop me a message at my e-mail or through Facebook. That's so cool you're going to Europe! If you want to travel with other young people and have someone else take care of everything, do a trip with Contiki Tours. For cheap flights around Europe, go with Ryanair or EasyJet. If you fly on a budget airline, check to make sure what airport it flies into. Ryanair's airports are often further away from the actual destination. Barcelona is a good example, as it actually flies into completely different towns instead of Barcelona. EasyJet normally uses the same airports as the major airlines, except in London. Which Budget can guide you to other regional budget airlines. To get the inside scoop on good hostels, check out BUG Europe and Hostelz. Then you can book hostels through Hostelworld. If possible, try to e-mail the hostel directly to book a bed. Hostels often have beds available that aren't listed on Hostelworld or other third-party websites. Browse through Rick Steves' website for more tips. He has a popular guidebook and TV show about Europe travel. One thing I noticed is that in many European cities, all the hostels are either good or bad. The hostels in Paris are almost all horrible except for MIJE, a group of 3 hostels in refurbished French chateaus. The hostels in Berlin are fantastic, especially Circus, where I stayed. Wombat's in Vienna is also really good. Have fun in Europe! Feel free to ask me any more questions.